OUTSIDE UK: ONE Pattern £2.00; TWO Patterns £3.50; THREE or more Patterns £4.50 (maximum £4.50! ZADIG is a very fine soft Alpaca blend with a slight Mohair appearance. It is a very versatile yarn and can be used single as for Design 71 or double as for Design 72 and 79. Machine Knitting Patterns are available for all the Designs featured below for Standard Gauge machines including Passap and Singer. The tension for this yarn will depend on the preferred texture. For instance for Design 71 the yarn is used single and the Main Tension is 6. 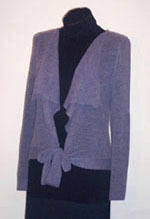 For Design 72 - the shawl collar cardigan, the yarn is used double on Tension 8. However for both, Design 79 - the skirt, and Design 79 B - the stole, the yarn is used double but the skirt is knitted on Tension 6 and the stole on Tension 8. Standard cone of 200g will knit the stole - 1560 mm by 570 mm. The PONCHO buttoned in front. The STOLE placed around shoulders and buttoned at each sleeve. The skirt, shown here in three different colours, can of course also be knitted in one colour. The Stole can be worn in a variety of styles and the pattern for the stole includes instructions for optional buttons and buttonholes. The front tie can be replaced with a button, buttons can also be incorporated along the front up to the fold of the 'collar'. 200g SINGLE will knit this top. Shawl collar smart jacket knitted in Zadig wound double. The Pattern is available for Machine Knitting in four sizes; it includes step-by-step instructions for finishing the lower front. 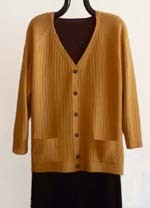 250g (already supplied wound double) will knit this elegant jacket.